The AAW-TBE-14-1 is a totally enclosed air-movement germicidal UV system for in-room control of airborne TB and flu, as well as other airborne viruses, bacteria and mold. The AAW-TBE-14-1 UV systems are designed to be portable or wall-mounted to reduce airborne microbiological contamination. 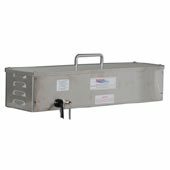 AAW-TBE-14-1 ultraviolet air cleaners feature stainless steel chassis, pull-chain switch, power cord, a fan and a filter. The High Output UV lamp is completely enclosed so the system can be on at all times protecting personnel and providing maximum germicidal UV disinfection. Re-lamping requires only disconnecting the power and opening the top cover. AAW-TBE-14-1 ultraviolet units are shipped assembled. AAW-TBE-14-1 UV fixture mounts via two keyhole slots in the back of the unit. These holes are on 12.5" center and require # 8 anchor screws. BALLAST: The UL listed solid-state electronic ballast is a Class P rapid start with a power factor minimum of .95. It is available for 120V 60Hz or 220V 50/60Hz and is designed to maximize photon production in air temperatures of 35º to 175º F. Ballasts have an RFI - EMI rating as defined by FCC part 18A for industrial / commercial applications in regards to suppression. The UV lamp must be replaced before the end of effective lamp life. UV lamps will continue to operate after that, however 254 nm output is not emitted. When installing the UV lamp or re-lamping use cotton gloves or make sure not to touch the lamp. Fingerprints on the germicidal UV lamp will reduce the ultraviolet output. Check the filter regularly and replace as needed.